CaseTrust is awarded by the Consumers' Association of Singapore (CASE) to companies that have shown a commitment to customer satisfaction. The CaseTrust for Education Scheme has been designed specifically by CASE for the education industry in Singapore. A school that achieves CaseTrust for Education is certified as an organisation that possesses the foundation for good quality student welfare/protection and standards in terms of clear fee policies, a well thought out student complaint process; trained teachers and administrative staff, and a clear statement reflecting its commitment to quality. You can read more about CaseTrust for Education on the case trust website. 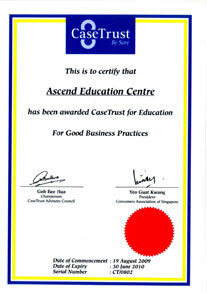 In line with CaseTrust requirements Ascend Education Centre Pte Ltd undertakes to be liable for any misrepresentation or unfair practice (as defined by the Consumer Protection Fair Trading Act 2004) by our appointed agents or their servants or agents. Ascend Education Centre has 5 full-time professionally qualified English teachers. Ascend Education Centre has 6 classrooms each with a capacity of 16 students each. Our English school is able to take 180 full-time students. We have a clear breakdown of tuition and non-tuition fees on our website and in all our marketing materials. We have a clearly stated refund policy on our website, on our registration forms, and on our receipts. We have a clearly stated students’ complaints procedure on our website and in our student handbook. Any personal information provided by you will be kept strictly confidential and is used only for the purpose of administering admission into our English School. We offer a 10% discount of tuition fees for students who sign up for 2-6 terms (6-18 months) on our full time EGL & IELTS courses. The discount is valid for the calendar year 2009. Clearly-defined entry requirements for each level of our English as a Global Language program based on our placement test. Up to date and relevant learning materials are used in class. The opportunity to prepare for internationally recognised tests in English language such as IELTS and TOEFL. Extra Cultural Activities (ECAs) organised outside the classroom on a termly basis. Small classes of no more than 16 students to ensure maximum teaching support. A well-established student feedback mechanism so we can improve the support we offer. Wireless class rooms with PCs for internet and email access. A library with over 300 titles. The Singapore government has established the Student Protection Scheme (SPS) to protect the tuition fees of all foreign students studying on a student pass in Singapore. From December 2004, all schools taking in international students are required to protect the tuition fees of the students through an Escrow account or by Insurance. Our school has opened an Escrow account with the Development Bank of Singapore (DBS) to protect the fees of our students. With this facility, students do not pay their tuition fees directly to the school, but into a special bank account, called an Escrow account. The bank will then pay the tuition fees to the school in installments over the duration of the students course. In the event of the school canceling a course or closing down, the bank will return the unconsumed portion of the tuition fees to the student. Upon registration all international students are required to enter into a Standard Student Contract that is legally binding between Ascend Education Centre and the student. Local students must also enter into a Local Student Contract with Ascend Education Center. Our trained Ascend customer service staff will explain the content of the contract before requesting your signature. You will be asked at each point of the contract that you understand what you are signing, the contract is available in Mandarin, Vietnamese and Korean. The tuition fees are payable to our ESCROW account with DBS Bank Singapore through cashiers order, cheque, cash or telegraphic transfer. Details and methods of payment can be obtained from the Customer Service Officer after proper registration and will be detailed in writing to the student in the Letter of Acceptance. A receipt will be issued for the amount paid. Payment of non-tuition fees is to Ascend Education Centre at the reception in the form of cash; cheque, cashiers order or telegraphic transfer in Singapore dollars. A receipt will be issued for the amount paid. Ascend Education Centre clearly states tuition and non-tuition fees incurred. Tuition fees and the non-tuition fees and their breakdown are clearly defined in the Standard Student Contract, payment schedules, payment vouchers, receipts, communication materials, on our website and our publicity materials. All prices are communicated in Singapore dollars (S$). The student has paid the following non-refundable fees: a registration fee of $150. Should a student decide to transfer/withdraw from Ascend Education Centre after 10 working days of the commencement date of a scheduled course, the student is not entitled to any refund of the course tuition fees unless alternative arrangement are made between Ascend Education Centre and the student as a result of mitigating personal circumstances facing the student. Ascend Education Centre reserves the right to cancel a course due to insufficient demand. Students who have applied for a course which is subsequently canceled will be notified at least 5 working days in advance of the commencement of the course. Students who have paid the course tuition fees and non-tuition fees are entitled to a full refund on all tuition and non-tuition fees (net of applicable bank charges). The Student shall be entitled to withdraw from the Course if Ascend Education Centre terminates the Course prior to the completion of the Course. The student is entitled to a refund amounting to the unconsumed portion of the course Tuition Fees (net of applicable bank charges) provided the course tuition fees have been paid in full. Ascend Education Centre is also required by CaseTrust to have a clear complaint process for students to follow if they become dissatisfied with a school procedure, the performance of a school employee, or if the student has a grade complaint. If you wish to make a complaint a copy of the student complaint form is available at the front desk from the Student Service Officer. We regard complaints as an effective improvement mechanism as they provide us with direct feedback on our areas of deficiency. Ascend Education Centre has a comprehensive system of managing customer complaints. There are three steps in addressing student complaints. The first two steps are internal to the school and the final step involves bringing the issue to the attention of an external party i.e. Case Trust. A complaint is any expression of dissatisfaction with the performance of an Ascend Education Centre employee or procedure. This regulation sets out the processes for various types of student complaints. Students are advised to consult with the Student Service Officer for advice in proceeding with these complaint procedures. The Student Service Officer shall also inform the student that a person that the student chooses will act as an advocate who will assist the student in the completion of the complaint process. The student may waive the right to an advocate. The student must file a complaint within two weeks after the action that gives rise to the complaint. The Centre Manager may suspend this rule under exceptional circumstances such as extended illness, holiday leave or absence of one or both parties to the complaint. When either party of the complaint is no longer in attendance at the school and the school does not expect the student to return, the Centre Manager shall give reasonable opportunity to complete appeal procedures or reply to the charges before making a decision. The student is encouraged to consult first either verbally or in writing with the employee concerned before initiating a complaint. If the student determines that the complaint may be resolved more appropriately without the employee concerned being involved, the student may contact the Student Services Officer. Complaints can be lodged with the Student Service Officer in either written or verbal form. The Student Service Officer will schedule a confidential interview with the student within three working days in order to understand the nature of their complaint and how the complaint can be resolved. If the complaint presented to the Student Service Officer has not been resolved, the student may bring the complaint to the Centre Manger who shall discuss the concern(s) of the student and the options available to resolve the concern(s). If the student should elect to proceed with a formal complaint, the student shall outline in writing the complaint, identifying dates and persons involved as accurately as possible and submit the written complaint to the Centre Manager. When the student's written complaint has been received by the Centre Manager, the complaint shall be forwarded to the appropriate parties and the employee concerned for a written response within five instructional days. The Centre Manager shall keep all written statements, transcripts and minutes associated with the complaint as a record of the proceedings. The Centre Manager shall inform the student regarding the nature of the written response of the parties. If the written response does not resolve the complaint to the satisfaction of the student, the Centre Manager may convene a conference of all the parties within five instructional days. As a result of the conference, the Centre Manager shall issue a recommendation to the Chief Executive Officer for resolution of the complaint. The recommendation of the Centre Manager will be reviewed by the Chief Executive Officer who may amend, modify, reverse or accept the recommendation and who shall then implement the resolution and advise the affected parties. The decision of the Chief Executive Officer shall be final. Appeals or formal hearings based on the decision of the Chief Executive Officer should be taken to Case Trust where the parties should make every reasonable effort to resolve the matter to their mutual satisfaction. Formal (in writing) complaints regarding alleged discrimination based on race, ethnicity, gender, age, sexual orientation, marital status and/or sexual or racial harassment should be presented to the Student Service Officer. Informal complaints based on alleged discrimination may be presented to any Ascend Education Centre employee. With informal complaints, the employee receiving the complaint must contact the Centre Manager within two days of receipt of the complaint so that an investigation process can be started in accordance with the appropriate school policies. The student is encouraged first to consult with the teacher concerning the disputed grade. If the complaint is not resolved through consultation with the teacher or if the student feels that the complaint may be resolved more appropriately without consulting the teacher, the student may contact the Director of Studies. The student should indicate the grade received in the course, the reason for the grade complaint, specific information on performance scores and attendance, and any syllabus or written material on course grading criteria that the instructor provided to the student. The Director of Studies shall keep all written statements, transcripts and minutes associated with the complaint as part of the files of the college. The Director of Studies shall investigate the student's written complaint. The investigation shall include a written response from the teacher listing the grade reported for the student, the evaluation criteria for the course, and the performance scores and attendance data achieved by the student in that course. The Director of Studies should inform the student regarding the nature of the written responses of the instructor and administrator(s) as well as the Director of Studies findings and conclusion. If the written response does not resolve the complaint to the satisfaction of the student, the student may petition the Exam Board Committee for review. The decision of the Exam Board Committee shall be final. Appeals or formal hearings shall not be provided. Our commitment to the protection of student data is clearly stated in our registration form, on our website and through our confidentiality policy: Ascend Education Centre treats all students' information and data with the strictest confidentiality. Students will be told before signing and submitting any documents that they are "Private & Confidential - For Internal Use Only". The exception to this is where Ascend Education Centre is required by government authorities or agencies to release information which they require for statistical reports or other reasons.